RICHMOND, Va. (AP) — Unsure of Kirk Cousins’ future, the Washington Redskins scoped out the quarterback market and saw a lot of unknowns. They knew Minnesota’s Case Keenum, Teddy Bridgewater and Sam Bradford were set to be free agents, scouted top draft prospects Baker Mayfield, Sam Darnold, Josh Allen and Josh Rosen, had veteran backup Colt McCoy under contract and were well-aware Kansas City had first-round pick Patrick Mahomes II waiting behind longtime starter Alex Smith. Washington turned its attention to the Chiefs, acquired Smith, signed him to an extension and handed him the keys to the starting job. The Redskins on Sunday hosted the New York Jets for the first of three joint practices, the scene of a contrast between two organizations that took divergent paths to solve their quarterback situations. While Smith is established as the guy for the Redskins, the Jets took Darnold third overall, signed Bridgewater, re-signed incumbent Josh McCown and put them into a three-way competition that makes training camp and the preseason a day-to-day evaluation. Redskins coach Jay Gruden remembers having Andy Dalton as a rookie QB when he was Cincinnati’s offensive coordinator, but that was different because the 2011 second-round pick got all the first-team snaps as the prospective starter. 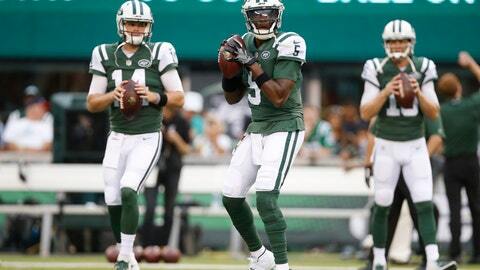 Bowles is playing the delicate balancing act of splitting up practice time between Darnold, Bridgewater and McCown and could wait until after the fourth preseason game to name his starter. Smith didn’t play in Washington’s preseason opener at New England and could see only limited work Thursday against the Jets. Meanwhile, New York rotated all three of its QBs against Atlanta, and Darnold could see the most action moving forward after an impressive debut in which he was 13 of 18 for 96 yards and a touchdown. Darnold got plenty of first-team snaps Sunday — taking the majority of the reps for the first time this summer — and got to show what he could do in the rain against the Redskins’ first-team defense. With buzz building up about the Jets’ QB of the future, the more work he gets against the NFL’s best on his own roster and others should show how ready he is to be their signal-caller of the present. Bowles wouldn’t reveal his plans for the second preseason game other than to say “all quarterbacks need to be ready to play.” After starting 13 games last year, the 39-year-old McCown figures coaches have a pretty good idea of what he can do at this point, and Bridgewater is cherishing any chance he can get. Gruden’s job with Smith as the starter and McCoy as the backup is more clear-cut. He’d still like to get Smith enough action to be comfortable for Week 1 but doesn’t envy the situation Bowles is in with three starting candidates and only one football. NOTES: The Redskins say RT Morgan Moses is OK after he was knocked down in a post-play fight during 11-on-11 drills Sunday. …. Washington OT Ty Nsekhe aggravated what the team called a lower-extremity injury. … WR Robert Davis is out for the season with knee and leg injuries. … Bowles said RB Isaiah Crowell (concussion) and OT Kelvin Beachum (foot) were among the Jets players left at home.